The Alice in Wonderland exhibition at the British Library finally opened last Friday (20 November) and we cannot wait to feast our eyes on beautiful editions from the likes of Melvyn Peake, Ralph Steadman (one of our favourites), Leonard Weisgard and the original manuscript and hand-drawn illustrations. To mark the occasion, The British Library opened an Alice-Themed pop up shop in the former ticket office and joined forces with Etsy to give emerging designer-makers the opportunity to produce and stock Alice-inspired pieces to be sold at the shop. 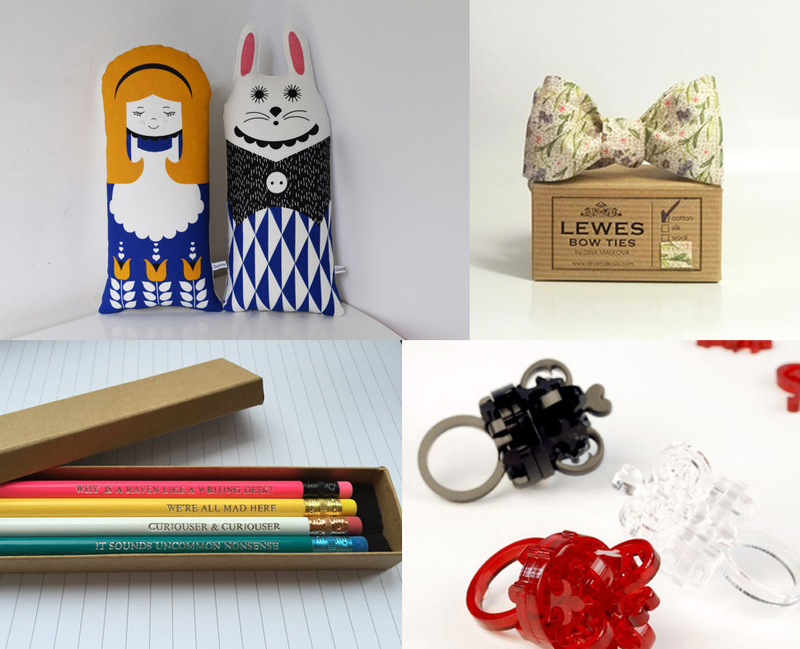 Winning designs of The British Library x Etsy competition include pencil sets featuring Alice in Wonderland quotes by Pobble and Ping, crown rings by Rentaro Nishimura, bow ties by Dina Moldova, Scandinavian-style screen printed dolls by Gunna Ydri and our Alice collection. We've been down the rabbit hole putting together our Alice collection for the past few months. Our range includes notebook sets, lampshades, cushions, handkerchiefs and phone cases. All items have been sourced in the UK and with the majority carefully hand crafted in South London by us. In addition to these products, we couldn't help but apply the designs to prints and cards. The original drawings by John Tenniel were a large influence on our work and can be seen in our designs of the iconic characters. Naturally the flamingos and hedgehogs are inspired by the well-known croquet game however we wanted to create a design which while related to Alice wasn’t necessarily obvious. The prominence of the bottles and food in the book was also too difficult to ignore and we had to include them. The Alice in Wonderland pop up shop will be open until 31 January 2016.